Kuubo is a multifunctional table well suited as a temporary workstation for conference and meeting use, team projects or any other function where importance is placed on communication. 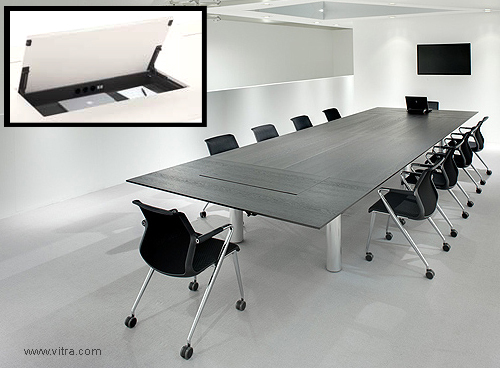 It is fitted with recessed compartments in the tabletop where files and laptops can be stored away and accessed at any time without interrupting the workflow. Opened with a gas spring mechanism and lockable, these storage boxes are connected to power and data cables that are neatly hidden away in the table legs.